ENLOY water bottle is perfect for everyday use as well as travel biking camping hiking pool, gym, playground, Yoga, beach, mountain adventure. The water bottle adopts Vacuum Insulated technology and fashionable design. We aim to provide a good experience of drinking to you. 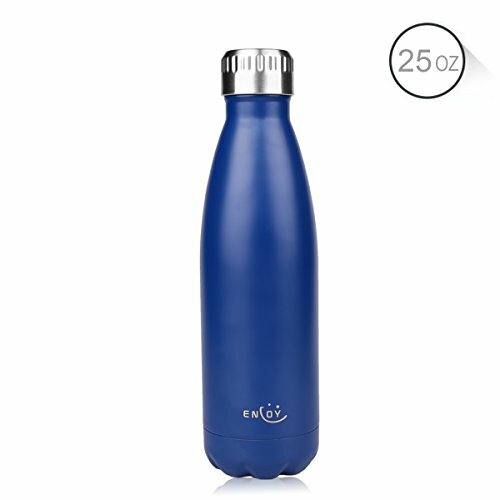 ENLOY water bottle is sturdy, corrosion-resistant, rust-resistant, anti-breaking, made of high quality 18/8 stainless steel. ENLOY water bottle is non-toxic, BPA free and environment- friendly, which ensure you drink water or beer safely every day. ENLOY water bottle features vacuum insulated and double walled design, which will not sweat or prevent your hands from high temperatures. Keep your drink cold in the summer or hot in the winter. . Leak Proof The water bottle comes with leak proof cap. You are able to put it in your sports bag, backpack, most car cup holder securely. ★The water bottle is not dishwasher safe, please be careful when cleaning your bottle. ★The rubber gasket of bottle lid for sealing, please don't take off it. ★Please do not store sugary drinks in the water bottle for more than 24 hours. ★Please do not put the water bottle in freezer or microwave.